So my challenge to this community of coders is to "Make a sub with the name LoadPNG to load PNG files to an image". Made some starting code for this challenge to avoid people saying "We do the work and this guy does nothing" LOL. also, in your code, you probably don't want to put the loading of an image (from disk), in your display loop! nor the 'destroyimage' there either! Thanks for tips and advices. I will look for that fbimage library and test it.
' byte1 as ubyte '89 - ??? print "open file with sucess"
print "it's a png file"
print "this is not a png file"
print "read 13 bytes of chunk info"
Welcome, here you will be remembered. We are fiddling around a lot with libs from the C world. There we find everything which is not in FB itself, including all the file loaders. If you use windows, then keeping things as simple as possible, please try this. 'An idea from UEZ in another thread. if fileexists(picture)=0 then print picture + " not found"
dodicat wrote: If you use windows, then keeping things as simple as possible, please try this. What?! So... if someone is using Windows, then this simple routine will work instead of having to force folks to use a library (FBimage)? which makes the program complete unto itself... never seen this in all my years here... will give it a go... does it matter 32 or 64 bit? What other formats will it load? Last edited by leopardpm on Jan 12, 2019 23:04, edited 1 time in total. Here is Bob at Drumbreddan Bay. dodicat wrote: Here is Bob at Drumbreddan Bay. Most of the time i am using libs ,ike cairo, fltk-c or fbimage where .png is included, so no need to care for this. And they all are platform independent. Maybe you decide one day to switch to linux or mac like i did. When only surfing or programming with geany i simply not notice a real difference in the view, because they are the same programs. But Linux Mint boots up much faster and it is a pain to hear windows rattling all the time on the HD. So why programming windows only if we can do it platform independent with the same effort? I forgot to download Imagemagick on my win10, so I'll have to. 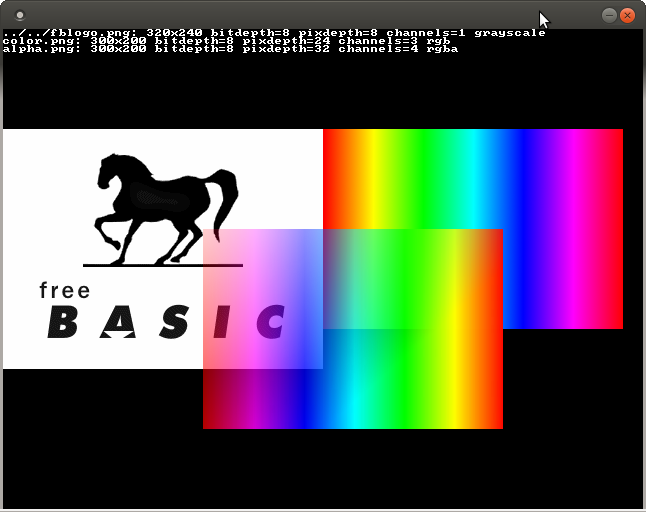 Anyway, in my opinion the easiest way is to shellexecute a Imagemagick command to do the conversion to a BMP. There is some test to do maybe because I don't know what bmps know about transparency. However all the code for conversion is already done and in any platform it will/should work. Last night i was "crusing" the freebasic directory c:\freebasic\inc and found out this 5 files. Complete mistery to me ... Does anyone knows how to use them ... Maybe they got a loading function in them ... Really don't know how to use them. PS: Thank you all for your tips and code. Or just replace #include once "png.bi" with #include once "png12.bi"